Rachel Art Jewelry is devoted to the design and creation of fine jewelry made from gold and silver, and set with precious stones and diamonds. 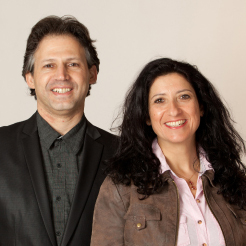 Since 1996, the company has been managed by its founder/owners, Rachel & Victor Eshkol. Victor Eshkol is responsible for the company's administration and marketing, while Rachel Eshkol, a graduate in Jewelry Design from the WIZO Haifa College, is the company's creative designer. Working in a classic style characterized by clean lines, Rachel's creations draw inspiration from ancient cultures and motifs of archeological finds, as well as from sculpture and artists' canvases, and from the textures and other wonders of nature. Her designs harmoniously reconcile the contradictions inherent in ancient and modern, East and West, while focusing on the integration of precious stones with raw material in a way that creates new layers of interest. Rachel is constantly on the lookout for unique materials and gemstones with which to create a new look, unusual and varied textures, and present them in the clean lines of her design style. Always open to new ideas, Rachel invites her customers to choose from the huge range of Rachel Art Jewelry designs, or to come up with their own design and place a special order. All items can be ordered in commercial quantities.